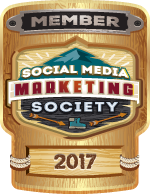 Hashtags are these: #SquibTip, #SMMW17, #socialmediamarketing. While the word “hashtag” may seem obtuse, it turns out the word is rather literal. Americans call this symbol, #, a pound sign; the Brits call it a “hash.” A tag is a phrase that gets added on to the end of something, often to put a “button” on the main content. (You hear the term used a lot in music. Badumbum a common tag added onto the end of a song or joke). A tag also refers to something that marks something (i.e. grafitti, indexing notes, etc). “Hashtag” literally refers to the # (hash) symbol plus the word or phrase that follows. (“Poundtag” doesn’t have quite the same ring to it as “hashtag,” so I’d say Twitter made the right call with its naming choice). A hashtag can be an identifying term such as the name of your organization, event or content series, i.e. #SocialSquib, #VG2016 or #SquibTip. It can also be a phrase that highlights an idea or attitude related to the post, i.e. #IDontGetTwitter or #ThatsWhatSheSaid. An important note on usage to spare you from epic eye rolls from any teenagers in your house: my explanation of the meaning of hashtag does not reflect how people use it when they’re speaking. #SquibTip is spoken as “Hashtag Squib Tip," not "Hash Squib Tip." The number one reason you want to be using hashtags is indexing. You know how they turn blue? That’s because they become links, and if you click on them, you’ll bring up a list of all the tweets that also use that hashtag. #NewJersey is a hashtag, and if you click on it in the tweet below, it will bring you to all the other tweets referencing New Jersey. It's a great discovery tool. ​If you’re running an event, you need to have an event hashtag, and you need to advertise it. Your hashtag lets your fans follow the conversation about your event and, even better, participate in said conversation. Then, because the posts are indexed, you can easily see their posts and reward people who use the hashtag by liking, retweeting, and commenting on their posts. I’m a sailor, and I love following sailing races. The Vendee Globe is a 4-month, single-handed, round the world sailing race, and #VG2016 was fans’ lifeline to follow the official race updates, videos from the sailors in the middle of the Pacific Ocean, and engage with other fans. Conrad Colman did an excellent job with his #crazykiwi. Hashtags help your build community. They’re also indexable by Google, and who doesn’t love a little SEO boost? Hashtag Pro Tip: Don’t put punctuation or spaces into a hashtag. Twitter will only index letters or numbers that follow the #. #IDon’tGetTwitter will only be indexed as #IDon. The correct form is #IDontGetTwitter or #idontgettwitter. Capitalization makes a hashtage easier to read but doesn’t affect how its indexed. Thanks to the character limits, hashtag use on Twitter is like having after-dinner tea in your mother’s demi-tasse cups—just enough to moisten your cake and keep you awake for the drive home. Instagram, on the other hand, doesn’t have the character restrictions, so hashtag use there is like a Starbucks Venti – 20 ounces of water (in case you didn’t already have to pee) and 2 tea bags for maximum brew strength so you can stay up all night finishing that paper. Facebook, however, is a bit harder when it comes to hashtags and indexing. The first challenge is that hashtags are not an integral part of the language of Facebook, so people use them significantly less often in their posts, even if they are hashtag fiends on Instagram. Facebook does index hashtags, and if you search a term on Facebook, it will bring up your friends who have used the hashtag, people with public profiles who used the hashtag, and pages who used the hashtag. What you won’t see, however, are non-friends whose profiles are private, even if they’ve used the hashtag. On Twitter and Instagram, though, most people have public profiles, so engaging with your fans who use your hashtag is super easy. Punctuation and Spacing = don’t use them. They put a break in the tag. Hashtags on Twitter = Use as space allows, 1-3 is a good amount. Hashtags on Instagram = Have a core one for your organization that you use all the time, 1-3 auxilliary go-to hashtags, and go nuts on other hashtags related to your post. Hashtags on Facebook = Use ‘em when they add value, but don’t go cray-cray. Like what you read? Sign up to keep reading. © COPYRIGHT SOCIAL SQUIB 2016.